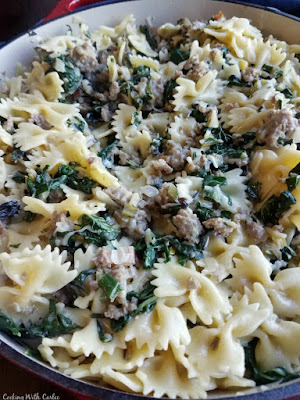 Sprinkled with cream and Parmesan, this sausage and chard filled pasta is sure to be a hit! 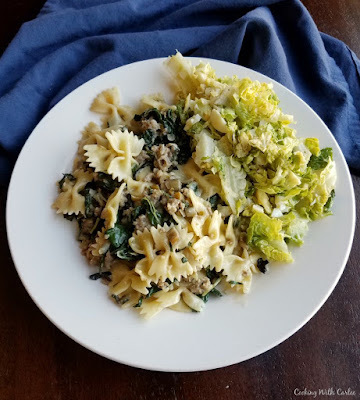 Fill your families plate with this lightly creamy Italian Sausage and chard pasta and they are sure to return them empty. Most likely there will be some compliments thrown your way too. You're welcome! Our fist box of produce from our CSA was loaded with greens. It's not too surprising seeing as that is what is most in season right now. A lot of those greens found their way into salads. There was the lemony kale and chickpea salad and the old favorite, wilted lettuce. With any luck I'll be sharing a bok choy salad soon too. With the summer heat upon us and the scurry we've been in, salads just make sense. But as I'm sure most five year olds would agree, Little Dude is not a huge salad fan. So I thought I had better turn the chard into something he'd like. Pasta is usually a pretty sure bet with all of us. Plus it's usually a quick and easy start to a weeknight dinner. For me Italian sausage is a life saver too. First of all, I think it is absolutely delicious. Plus it adds so much flavor on its own so you don't have to add a ton of seasonings to the dish. You could really use a variety of greens in this dish. Kale would be great. Just remove the stems and chop it relatively finely. Spinach would be great as well. However we really enjoyed the chard here. 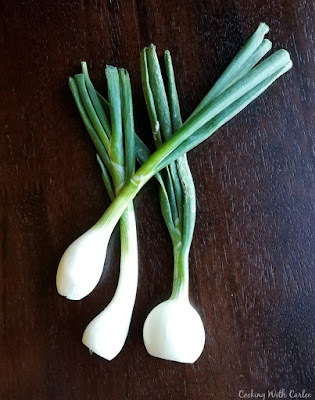 Rather than discard the stems, I sliced them thinly and sweated them down with the onion and sausage. That made them super tender and mild. It was a great way to boost the vegetable content in dinner and make the most of our beautiful produce. A little splash of cream and a sprinkle of Parmesan takes almost any pasta dish to the next level in my opinion. It makes for a simple and flavorful sauce that brings it all together. I am happy to say this dinner was a big hit with our gang. Little Dude was very complimentary and was asking about the greens. This will definitely be on our table again soon! Cook pasta to al dente according to the package directions. Reserve a mug full of pasta water, then drain and set aside. Remove the swiss chard greens from the stems. Trim the bottoms off the stems and then thinly slice them. Tear or roughly chop the greens and set aside. 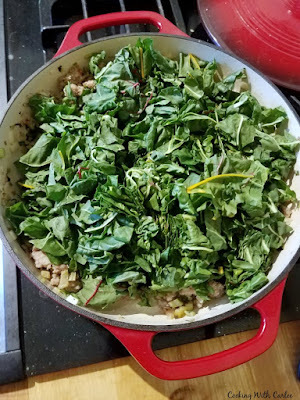 In a large skillet or small dutch oven (I used a 3 qt braiser style), cook the Italian sausage, onion and sliced chard stems until the sausage is browned and the veggies are soft. Add the red pepper flakes and garlic and cook until fragrant. Deglaze the bottom of the pan with a bit of the pasta water. Be sure to scrape up any browned bits. Add the chopped chard greens to the pan and cover, cooking until they are wilted. That should take about 3-4 minutes. Stir in the al dente pasta and cream, cooking until warmed through. Add a little more pasta water if needed to bring it all together. Remove from heat and stir in Parmesan cheese. Taste and season with salt and pepper if needed. Looks like a great meal. Isn’t it amazing how all of those healthy greens cook down. I love that you added the stems! They do go from a mountain to not so much. I figured the more veggies, the better! 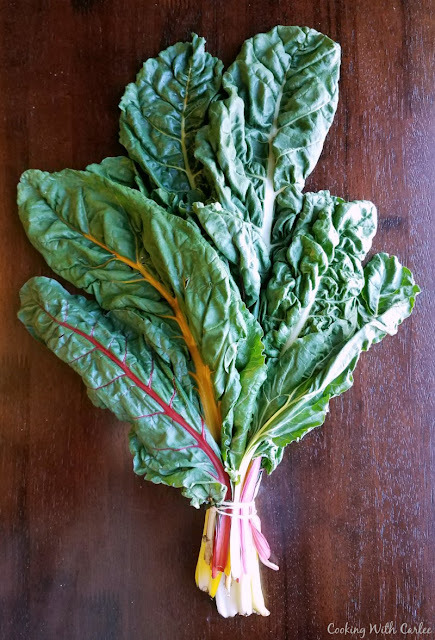 I'm going to have to remember to keep and eye out for some Swiss chard the next time I'm at the farmer's market! YUM!!! You definitely should, it's beautiful right now! Carlee!! I keep seeing this photo everywhere, and it looks soooo good! And, in our downsized garden, I skipped this Swiss Chard this year! I will have to get some at the farmers market, because this dish would be a complete hit in my house! We need to try planting more fun greens, we normally only do spinach and/or leaf lettuce. We downsized too, so we don't have any greens this year either. Luckily we are getting a bunch in our boxes. That looks yummy! I have never tried swiss chard but we do eat a lot of spinach in our house. Pinned. It would be great with spinach! Yes, it seems like those little ones aren't real fond of too many salads. This does sound like a nice hearty meal. 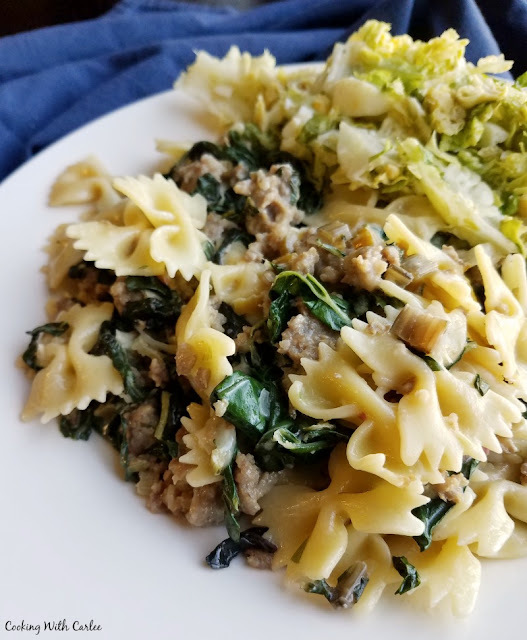 I do like italian sausage and pasta so this recipe sounds like a winner. It was a fun change of pace from all of the salads we have been having, that is for sure. Little Dude kept asking for the leftovers the next day, so I'd say that's a good sign too!